An unexpected but welcome sequel to The Wave (2015), The Quake is pretty much the same movie but on a grander, more devastating scale. There’s the usual long build up before the titular disaster happens, and there are the usual scenes where the hero tries to convince everyone around him that he’s not crazy or alarmist or both, and there are the standard, minor precursors to the main event to help build up the tension. It’s formulaic, and for the most part entirely predictable, but thanks to an astute script – courtesy of returning writers John Kåre Raake and Harald Rosenløw-Eeg – and Andersen’s confident handling of the material, this is that rare sequel that is as as good as the original. Having the same cast back to play the Elkjord family helps too, and the decision to have Kristian estranged from them due to his suffering from debilitating survivor’s guilt, gives many of the movie’s earliest scenes more of an emotional impact. So much so, that when it comes time for Kristian to take on the mantle of rescuer, the increasing peril everyone finds themselves in is all the more effective for the viewer in that there’s no guarantee they’ll all survive. As with the scenario in The Wave, Raake and Rosenløw-Eeg have taken a real event in Norway’s history – the 1904 earthquake referred to hit 5.4 on the Richter Scale – and then explored the current research which advocates the strong possibility of another earthquake on the same scale happening at some unguessable point in the future. This plausibility adds to the credibility of the movie, and makes the actual earthquake depicted feel as if it could actually happen (there’s a restraint too in the amount of devastation that’s caused that also feels right). Joner and Torp reprise their roles with the same integrity and commitment they brought to The Wave, and there’s strong support from the rest of the cast, though Amdam is stuck playing the kind of blinkered character you hope will end up being taken out by a collapsing building. The cinematography is suitably bleak with a subdued colour palette and often gloomy lighting, but this is in keeping with the pessimistic nature of the material. The special effects are impressive without going over the top, and the various obstacles and problems that Kristian has to overcome to keep his family safe are well crafted and well thought out. 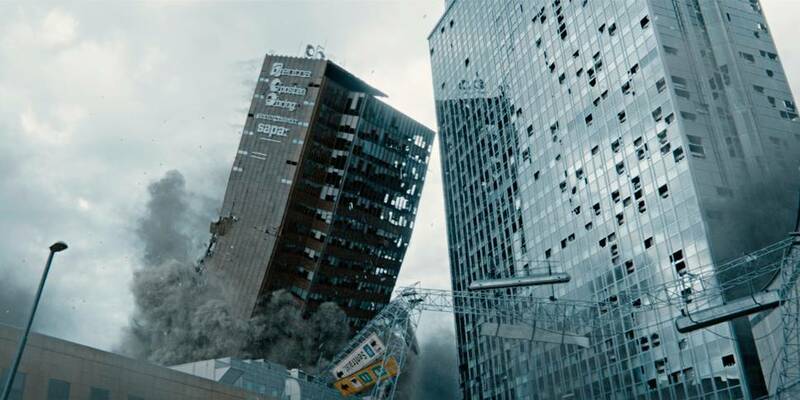 The last thirty minutes are as tense and as nerve-wracking as anything else you’re likely to see in the disaster movie genre this year, but it does make you wonder, what next for the unfortunate Elkjords? 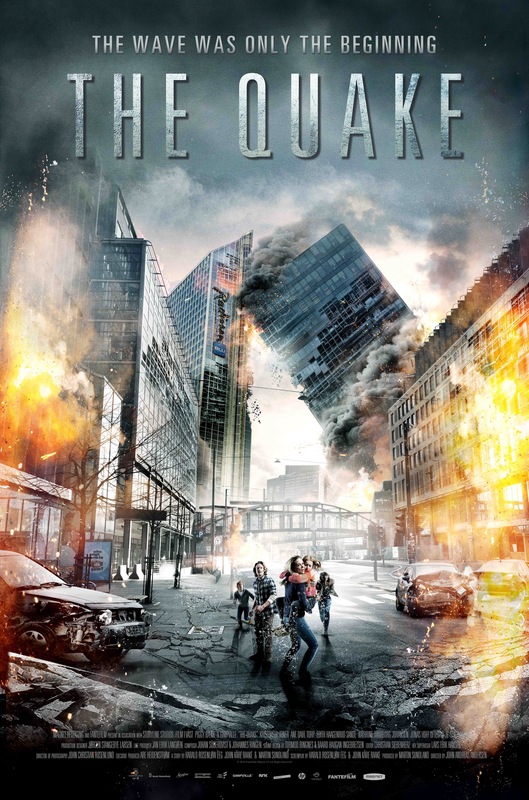 Rating: 8/10 – with a slow start that concentrates on its characters and promoting the inevitable danger they’ll face later on, The Quake offers a number of edge-of-the-seat moments in amongst all the mayhem, and it does so with a great deal of shrewdness and self-assurance; with a surfeit of suspense, and a handful of visceral shocks, this is an object lesson to how to make a disaster movie feel realistic, and how not to lose sight of the characters once it all goes spectacularly wrong. A Norwegian drama focusing on the lives of five people who all live and (mostly) work in the same small section of Oslo, Cold Lunch introduces us to Leni (Torp), a forty-something woman who has spent the majority of her life in an apartment with her father; Christer (Hennie), a young man who can’t pay his rent; Heidi (Tjelta), a young mother whose husband, Odd (Sydness) is controlling and abusive; Turid (Svendson), a fifty-something woman who does her best to live an active, fulfilling lifestyle; and Kildahl (Floberg), whose disabled wife hates and despises him. When Christer leaves for work one morning and he gets bird poo on his clothes, the “accident” sets in motion a chain reaction that brings these characters into each other’s orbits. Using the washing machine of the building next door to his, Christer realises his money is in the pocket of his waistcoat. Unable to open the washing machine, he finds the fuse box and pulls out the main fuse. As he retrieves his money, Kildahl appears and challenges Christer, who promptly leaves (without apologising for causing everyone in the building an inconvenience). Upstairs, Leni’s father has been killed as he attempts to restore power to his flat using his own fuse box. Leni sees his body but does nothing; eventually Kildahl and an electrician visit the flat and find the old man. In another apartment, Heidi is looking after her infant son. With the power having been cut off, some of her husband’s clothes aren’t washed or ironed; he gets angry and when Heidi pleads for his understanding, Odd slaps her across the face before leaving. Nearby, Christer quits his job because the store owner he works for won’t lend him the money he needs to pay his rent. Odd works for a property management company; he finds Leni at the flat and informs her that her father’s contract for the flat ended when he died, and she must leave within the next two days. Later, Kildahl is having dinner with his wife; angry with him and her condition she urinates while sitting at the dinner table. Over the next couple of days, their lives intersect and new bonds are forged, while others are strengthened (or made to endure), and one is curtailed almost as soon as it’s begun, and one more remains unchanged. Leni learns how to cope in the outside world, Christer gets an offer to join a small crew taking a boat to the Caribbean, Heidi tries her best to become a better partner to Odd, and mother to their son (with terrible consequences), and Kildahl and Turid both take each day as it comes in the hope that their lives will improve in some way, however small. The writer and philosopher Henry David Thoreau once wrote, “The mass of men lead lives of quiet desperation”. And so it is with Cold Lunch, its characters seeking ways out of their individual predicaments, and not knowing how to find them. It’s a bleak, unforgiving kind of movie, intent on showing what can happen when we all have a bad day, and the repercussions that, often, we’re not even aware of. Happiness, the movie seems to say, is fleeting, and by no means guaranteed, even if you work hard for it, or deserve it. By chance, Leni finds a job but she is still all alone in the world – a scene in a cafe sees her nodding in acknowledgement to a woman at the next table. When she does it again, the woman is unimpressed and turns away. Unable to connect with the world around her on a meaningful level, Leni (who appears to be the movie’s one “success” story) will always turn inward for comfort and peace of mind. Likewise, Christer and Heidi find it difficult to connect with others. Christer is almost entirely dependent on the people around him but he has a fundamental distrust of everyone. He has a moment of self-awareness that seems to bring about a kind of personal salvation, but how long it will last is uncertain. Heidi’s life is even more wretched, her proclivity for self-denial dictating her behaviour at every turn. She too has a moment of self-awareness (mixed with a burst of self-confidence), but it’s fleeting and she renounces any chance of changing her life almost straight away. Her future is the bleakest, and has a grim inevitability. The same can be said for Kildahl, his relationship with his wife entirely one-sided, his attitude toward her more as a parent with a disabled child than as a husband to his wife. They are both locked in a loveless marriage of co-dependency, and as both are middle-aged, they will continue to make each other miserable for some time to come. And Turid, whose life, at least, is governed by principles, doesn’t realise just how these principles will continue to keep her alone. 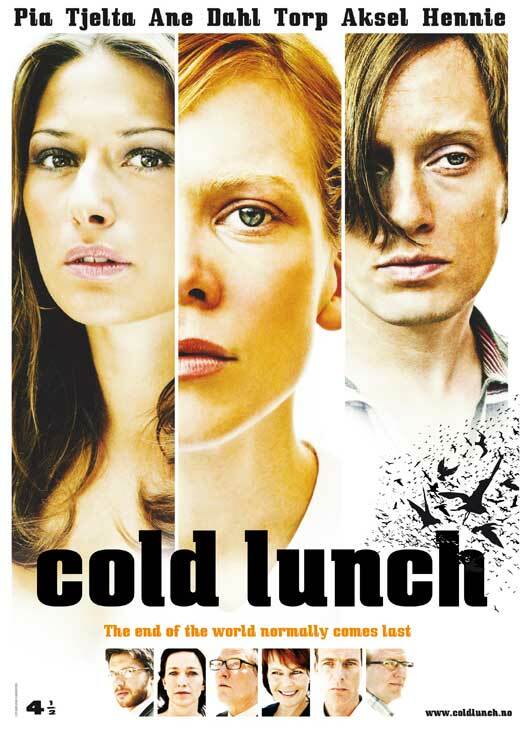 From all this it could be assumed that Cold Lunch is a dark, depressing movie, but despite its subject matter, it’s an oddly positive movie that makes you root for the characters even when you know there’s very little hope for them. Per Schreiner’s script also has quirky moments of dry humour and unexpected levity amongst all the gloom. There are good performances all round – Torp and Hennie are particularly effective – and the photography by John Andreas Andersen is understated while also emphasising the bright, airy rooms and outdoor spaces the characters inhabit (which reinforce how alone they are). Making her feature debut, director Sørhaug shows sound judgment in her approach to the material and alleviates the doom and gloom with carefully constructed moments of hope, along with the aforementioned levity. At times, she walks a bit of a tightrope in getting the balance right, and there are moments when the movie stumbles under the weight of its ambition – an homage to Hitchcock’s The Birds is clumsily done, and leads to an accident that no one responds to in anything resembling an appropriate manner – but all in all, Cold Lunch is quirky, and oddly affirmative despite its characters trials and tribulations. 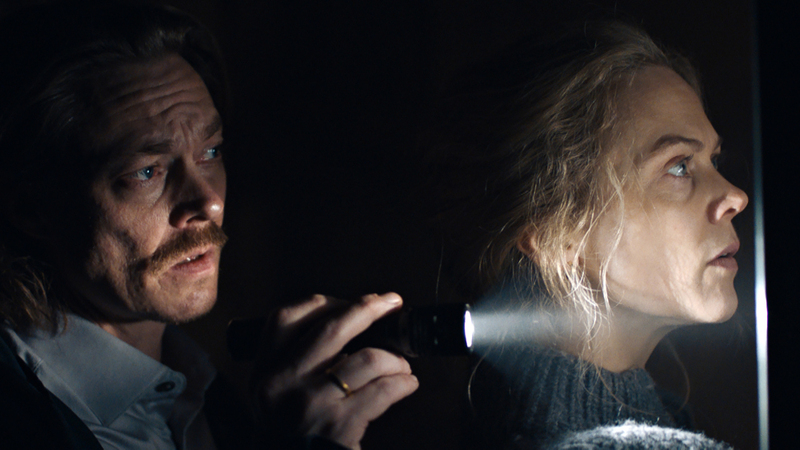 Rating: 8/10 – darkly humorous at times, and in a way that only the Scandinavians can pull off, Cold Lunch is not for everyone; too downbeat for its own good at times, it’s nevertheless a movie well worth seeking out and rewards on closer inspection.